It’s hard to believe, but the Sunday Supper Movement is turning two–proof that time does fly when you’re having fun! 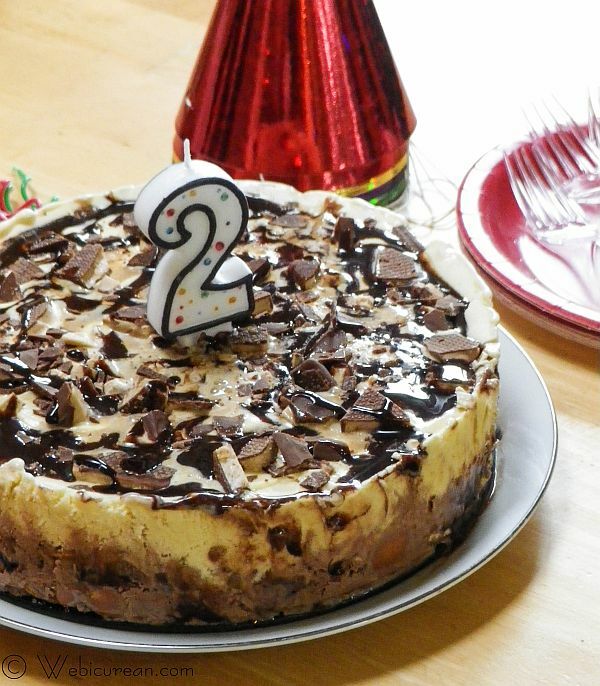 In honor of this milestone, Liz over at That Skinny Chick Can Bake is hosting a virtual birthday party for the group, and I’m bringing my most often requested dessert–Kahlua Toffee Ice Cream Cake. Of course, there’s a little something for everyone here–the line-up from the rest of the crew ranges from cocktails and appetizers to entrees and desserts (all the recipes are listed below), so get ready to dig in. 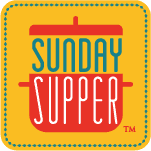 Looking back, I can still remember being nervous about my first #SundaySupper post. I had asked Isabel over at FamilyFoodie.com to join the #SundaySupper Movement in March, although the relaunch of my site was still a few months out. Everyone in the group was so welcoming and helpful, and there really was nothing to be worried about at all. The new Webicurean was ready for prime time at the end of July 2012, and I participated in my first #SundaySupper on August 4, 2012–the #CookforJulia event. Since then, I’ve whipped up something for most of the #SundaySupper events. More importantly, though, over the last year and a half, I’ve come to know the wonderful bloggers in this group, some of whom I’ve met in person, and I can honestly say, they’re some of the best folks around. Not to mention I’ve learned so much from them, truly. Now, about this ice cream cake. I’ve been making this going on 30 years now, something I probably shouldn’t admit because it makes me sound really really old. But, this is the one dessert that’s always a hit, and it’s requested often. Let’s be clear, though, there’s no cake in this cake. It’s all about the ice cream, as it should be. Don’t get me wrong, I love cake and ice cream, but I don’t like frozen cake, which is what happens when you mix cake and ice cream in the same pan. 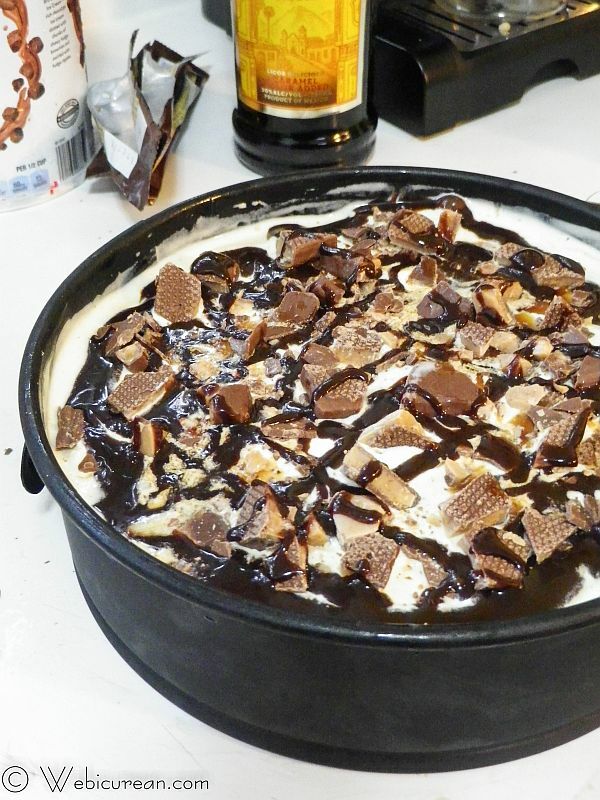 Instead, this cake is a dreamy combination of chocolate and vanilla ice creams, layered with things like Nilla wafers, crushed Heath bars, Kahlua, and chocolate syrup. It’s very decadent, and oh-so-simple to make. Just be sure to give yourself enough time so that it sets properly–nobody wants a runny cake! Spread the chocolate ice cream evenly over those Nilla wafers. 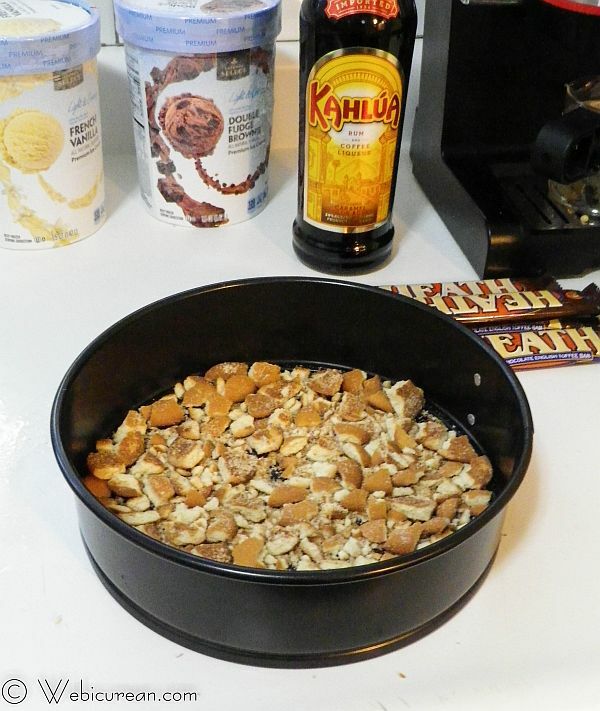 Next, crush the remaining Nilla wafers over the chocolate ice cream, along with 2 of the Heath bars, and half the chocolate syrup and Kahlua. Spread the vanilla ice cream over that, then top with the remaining crushed Heath bars, chocolate syrup, and Kahlua. Just so you know, I don’t actually measure the chocolate syrup or the Kahlua–I just freely drizzle it over the cake. You’ll need to let this set in the freezer for about 8 hours or overnight before serving. 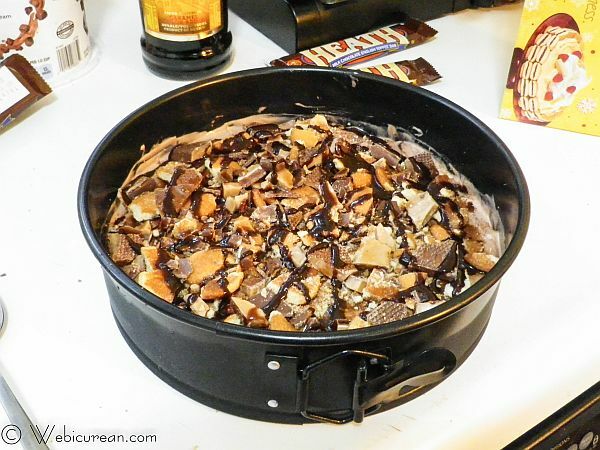 This Ice Cream Cake is a decadent combination of chocolate and vanilla ice creams, layered with Nilla wafers, crushed Heath bars, Kahlua, and chocolate syrup. Remove ice cream from the freezer and allow to sit out and soften for about 15 minutes. Crush 2 dozen of the Nilla wafers, and spread them evenly on the bottom of a 9-inch springform pan. Spread chocolate ice cream evenly over the Nilla wafers. Crush remaining dozen Nilla wafers over the chocolate ice cream. Crush two of the Heath bars, and sprinkle over that. Dribble 2 tbsp of the Kahlua and 2 tbsp of the chocolate syrup on top. Cover and place in the freezer for eight hours or overnight. To serve, remove pan from freezer, and let sit out for a few minutes. 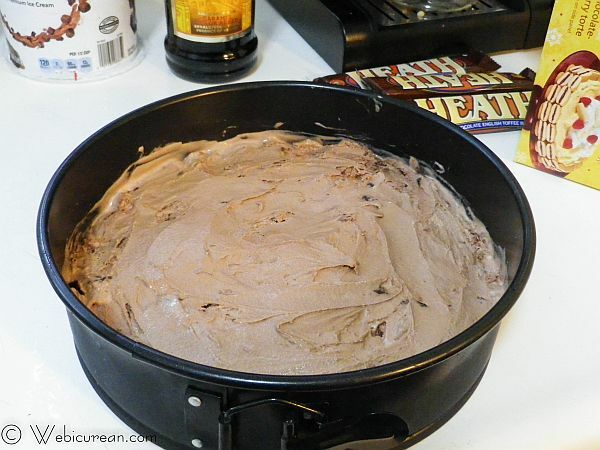 Run a knife around the inside of the pan to loosen the ice cream from the sides, then carefully release the latch and remove the side of the pan. Return the remaining cake to the freezer immediately after serving. *Note: Rather than measuring this out, it's easier to just carefully pour directly from the bottle and eyeball the amount. Let’s see what the others are fixin’ up! Would you like to join the Sunday Supper Movement? Itâ€™s easy! You can sign up by clicking here: Sunday Supper Movement. Did someone say toffee? I am all over this one! I so enjoyed meeting you at Camp Blogaway last year. Oh, my. This is the cake of my dreams!!! I can see why it’s a most requested dessert…I need to make it ASAP! 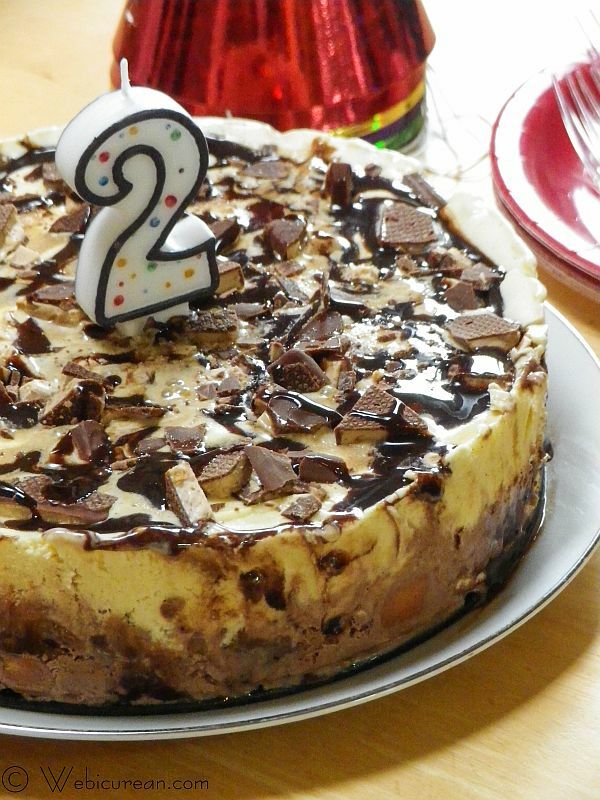 What an original and creative cake – who could say no to Kahlua, ice cream and chocolate?! Anne – What a perfect cake to bring to a birthday celebration! It is just gorgeous!!!! It was such an honor meeting you and breaking bread in person in 2013. I hope that we see each other again in 2014. Thank you for all your support. Wow. Can you come to my next birthday party? This looks so fantastic! This cake looks fantastic. Happy New Year. oh my goodness. . I love this Kahlua-Toffee Ice Cream Cake!!!! totally pinned and can’t wait to try this! What a gorgeous cake, I love making ice cream cakes. They are easy and everyone loves them. Happy #SundaySupper!!! This is the perfect treat for hot months (and we have plenty of those in the desert!) when I don’t want to turn the oven on! And perfect for a celebration! Pinning on my Recipes to Try board, Anne! This could not be any more perfect. I’ll take seconds, please! I am not surprised this is your most requested dessert, it looks amazing. Ooh this sounds and looks so decadent and a fitting dessert for this celebration!I’m craving for a bite of this right now! !Its been a pleasure cooking with you! And I thought I was the only one that didn’t like ice cream cake (with frozen cake in it). I like to keep it separate. Now this, OH. MY. HEAVENS. I’ll take a giant wedge, please and thank you. Totally amazing! Very much impressive! Thank you for sharing. 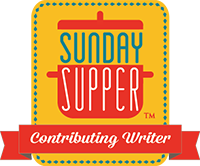 #SundaySupper Turns Two – It’s a Birthday Bash! Provencal Seafood Stew #SundaySupper - Healthy. Delicious. #SundaySupper Turns 2! Celebrate with Me and Original Slow Cooker Party Mix! Happy Birthday Cake Mix Truffles #SundaySupper Turns Two!